Yes or No Activities is one our most favoured resource. You can use these word sort cards as a ‘grab and go’ independent activity or choose the specific questions and word cards which are appropriate for your learning objectives. The phonics word sorts questions relate to our phonics charts. Again, just use the ones appropriate to your style of phonics program. For example, if you are covering the basic short vowels – just pick out the short vowel question cards and use with the cvc word cards, or any word cards for older children. 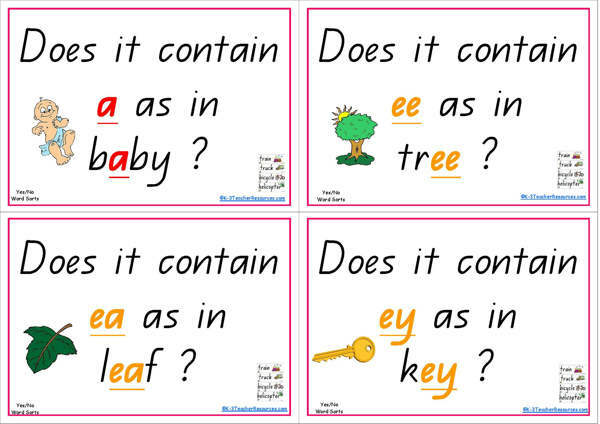 For example, if you are working on the long vowel ‘ai’ sound – just use the ‘ai’ question card and any word card set or specific word cards from the phonics words sets. 1. Choose ONE YES/NO QUESTION CARD – use that 1 question with a group of word cards to answer yes or no for each word. 2. Choose ONE WORD CARD AT A TIME – use one word card at a time to answer yes or no for each question. For whole class work – blu-tac or pin cards on the ‘board’. Children then come out and take turns moving the cards to the appropriate yes or no position. Have a number of laminated ‘yes’ ‘no’ cards and question cards ready to go – children can grab a set of words and a set of questions and yes no cards. We have included one spare page for you to write in your own questions.